Lots of thread changes and fractional stitches. Both of which give lots of detail. But detail can be achieved without the fractionals! Never mind, I've started now, so I'll get on with it. Maybe this is what it will take to get me back at my sewing machine! The design is called Woodland Alphabet. By Jamlynn. Very pretty. 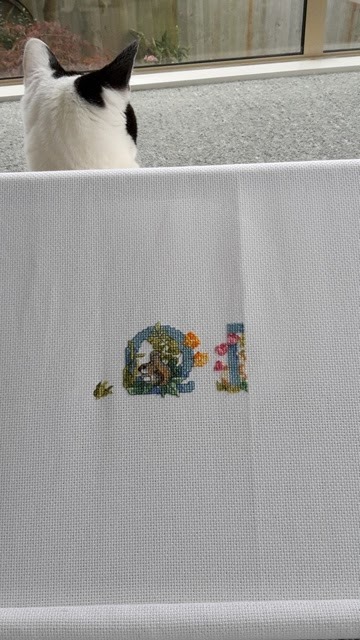 24 letters with lots of little critters and even more little flowers. So will the cat I'm sure! I tried to shoo her away, but she insisted on being in shot! fractional stitches take lots of time don't they! Come for a walk in the garden? Keeping up with the greenhouse.